The 2018 PMC Annual Seed Sale has started and will last throughout the growing season (September) while supplies last. Orders will be fulfilled on a first-come, first-served basis. The availibility list will be online on April 16. 2018 Annual Seed Sale List. The Foundation Seed Program at the Plant Materials Center aims to provide the highest quality low generation seed (foundation class seed) to producers for cultivar seed production. Certification is important to identify that plants have been handled in such a way as to meet high standards of pedigree retention, varietal purity and viability, and that are free of weeds, diseases and physical damage. This process encourages the production of high quality seed of superior varieties for agricultural interests and revegetation needs. The seed or vegetative propagating material directly controlled by the originating or sponsoring plant breeder, institution or firm which supplies the source for the initial and recurring increase of foundation seed. The seed that is the progeny of breeder seed. Production is carefully supervised so as to maintain specific genetic and physical purity. Registered seed is the progeny of foundation seed and must be handled carefully to maintain satisfactory genetic and physical purity. 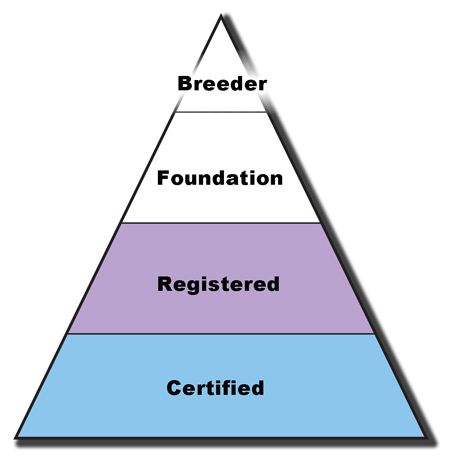 Certified seed is the progeny of foundation or registered seed which has the genetic and physical purity needed for certification. The Seed Increase Pyramid illustrates the multi-phased seed increase process, whereby 3 pounds of breeder seed can be increased to a commercially usable quantity. Clean seed yields are based on 80 lbs./acre. The planting rate is based on 3 lbs/acre for seed production and 40 lbs./acre for reclamation purposes. Breeder Seed: 3 lbs. becomes 80 lbs. Will plant a one acre foundation field. Foundation Seed: 80 lbs. becomes 2,160 lbs. To be planted as registered or certified production. Registered Seed: 2,160 lbs. Will plant 720 acres of Certified Seed. Certified Seed: 57,600 lbs. Will plant 1,440 acres of erosion control or revegetation projects. The Plant Materials Center occasionally offers Foundation class or equivalent seed product for sale to Alaskan Agricultural Producers. Notice is given approximately one month prior to the sale, and the allocation period now will last throughout the growing season. To order seed, email Pete Johnson or phone him at 907-745-8105.